Fonts come in all shapes and sizes, but when it comes to poster design, there are certain types of fonts that can help you make bold statements and attract attention. In this post, we feature some of the best fonts for posters you can use to create the perfect poster design. It’s quite difficult to generalize poster design. There are just too many types of posters that require various design standards. For example, a poster you design for a business conference and a poster you make for a summer beach party will require completely different designs, including different colors, shapes, layouts, and more importantly, fonts. When creating this collection of fonts, we decided to cover all categories of poster designs and include both formal and casual fonts you can use to design titles, headers, and text for various types of posters. Hopefully you’ll find the perfect typeface that matches your project! Burton is a stylish font that comes with mixed elements of both retro and modern design. The font’s bold look will allow you to craft eye-catching headlines and titles for posters. It comes with lots of alternate characters, symbols, and ligatures as well. Lemonade is a creative font with a fresh design. This font will fit in perfectly with your fun, creative, and entertaining poster designs. It will also look great on vintage-themed posters. As a bonus, you’ll also get 5 unique and editable vintage vector badges with this font. This font comes with a bold and unique look that makes it ideal for designing posters for movies, rock music events, and many others. It features a hand-brushed design. The font is available in several versions, including all-caps typeface and swashes. Morton is a modern poster font that is most suitable for designing posters for formal events, such as business conferences, networking events, and exhibitions. The font features a professional design and it comes in 9 different weights. Reef is a casual font featuring an attractive rounded design. You can use this font to craft poster titles as well as paragraph text. The rounded look also makes it ideal for both professional and casual poster designs. Helios is a unique sans-serif font with a futuristic space-themed design. It includes all uppercase letters, numbers, and punctuations. The font is also available in rounded and regular versions. It’s perfect for designing technology-related posters. If you’re working on a vintage-themed poster for a special event, holiday promotion, or a business, then this font will come in handy. It comes with a creative design featuring many alternate characters, ligatures, making a total of 550 characters. The Painter is yet another vintage-themed poster font you can use to design bold titles for posters. It features a design inspired by traditional sign and brush lettering. The font includes a total of 420 characters. Originals is a creative font that features a fun and quirky design. The font is available in multiple versions featuring different designs. It’s most suitable for designing posters for school, children, and entertainment events. This font comes with an elegant design that makes it the perfect choice for designing posters for business, branding, and product promotions. It includes lots of stylistic alternate characters, ligatures, and more. This is a font you can use to design creative posters for holiday-themed events and promotions. It’s a brush font that looks better when used with all-caps. The font is available in both TrueType and OpenType formats. Betrobe is a layered font that comes in Regular, Outline, and Extrude typeface styles. It features a retro-themed design that will allow you to create titles for creative posters with a 3D-like effect. Monofor is a creative font featuring an uncommon design. You can use this font to craft posters for fashion, apparel, travel, and other brand-related events and promotions. It also includes alternate characters and multi-language support. This font comes with a modern design that makes it perfect for designing titles for travel, business, event, and other promotional posters. It features a handmade script design and comes in TrueType and OpenType formats. Zeky is a modern font with a classic design. It features an elegant formal design that will make your posters stand out from the crowd. This font is most suitable for designing posters for fashion, apparel, and luxury brand promotions. This poster font features a creative design that makes your text look like cave paintings from thousands of years ago. It’s ideal for designing creative and entertaining posters. The outline version of the popular Portico font looks perfect for designing technology and business event posters. According to its designer, and from the looks of the previews, the font looks great in neon colors. 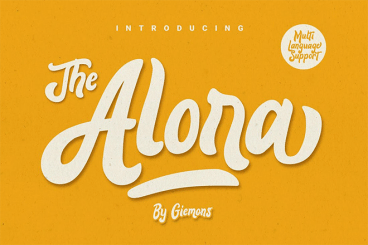 Alora is a modern and creative poster font featuring a quirky design. It’s perfect for promoting special events, holiday-themed promotions, and posters related to kids. Hennigar is a Neo-Grotesque sans font that features a unique and formal design. You can use it to design posters for formal events, business conferences, and more. Fort Collins includes a pair font that seems to go well together, especially if you’re working on a retro-themed poster design. It includes a condensed sans font and a handwriting script font. This is the perfect font you can use to design attractive and scary-looking posters for Halloween events and promotions. It comes in 6 different styles, including grunge and inline. Snowy is a unique font that features a floral design most suitable for winter-themed poster designs. The font has been created using a new font format known as OpenType-SVG. You’ll need Photoshop CC 2017 or Illustrator CC 2018 or better to use this font. We also handpicked a collection of the best fonts for flyer designs. Be sure to check it out.